When I was a kid, and my dad was driving me around to comic shops and conventions, he would spend his time looking at some of the more unusual comic books that we sometimes got here in America. 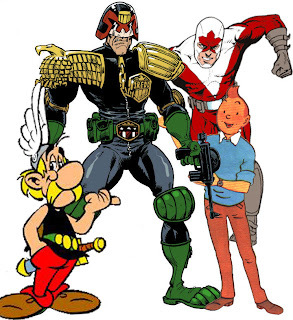 So I consider myself quite fortunate to have been exposed to the likes of Blueberry, Akira, Lone Wolf, Asterix, Iznogoud, Judge Dredd, and Rogue Trooper at a fairly early age. But after leaving home for college, my father fell out of comic books by and large and I couldn't afford to keep up with those characters as well as the Marvel pantheon that I had a more immediate interest in. As I'm weening myself off the staid superhero, and I'm heading over to Great Britain in August, I thought it best to try to get something of a refresher in international comics. I've noted some of my recent forays into manga here before. I just got word of a recently published book on the history of Candain comics which sounds quite interesting. So now I need to get back to British comics and find out what's out there and what is or isn't worth taking a look at. I presume 2000 AD is still something of a "mandatory" British comic and Beano seems to fall in that camp, too. What else out there is worth picking up? I'm especially interested in stuff that really has no chance in getting across the pond, so would anyone care to offer some suggestions on things I should be reading up on before taking off for London? Well, I started to write a comment, but it rather grew out of hand. Part one of the resulting blog entry might be of use. Part two to follow.